Good. It was good. Saying this, I know I'm a liar, since I told you I was going today, but I decided I'd go last night instead - more fellow Aleanders to enjoy brews with! The Space - The new-ish event grounds at the edge of downtown Charlottetown. Lots of parking nearby with a spacious pick-up & drop-off area. The fest was inside one large tent, with some outdoor seating (complete with propane heaters and The Big Orange Lunch Box's food trailer). 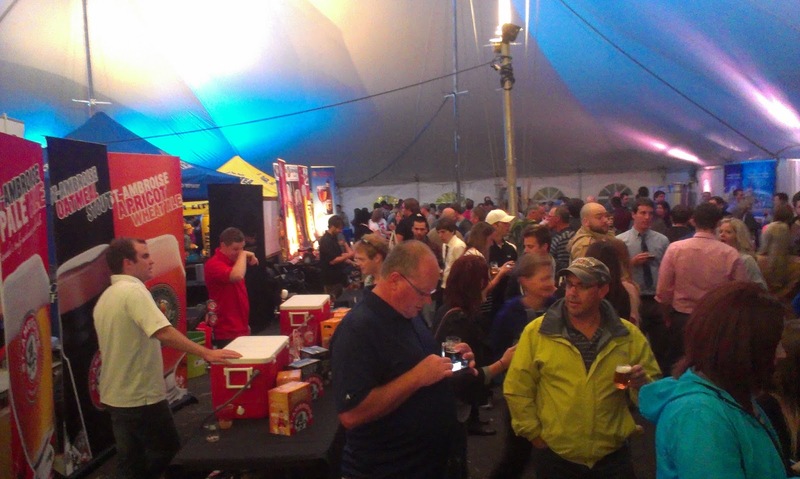 The tent was set up well, with two rows of breweries up the middle, and the rest around the perimeter. A bit of nice lighting, some seating near the live music in one corner, the odd corn stalk... the mood was set. There were lots of rinsing / dumping spots, and many porta-potties outside for the people with wee bladders. It definitely got busy, but not so crowded that wait times for brews or tempers ever got high. Even the premier & his Mrs. along with several other folks that serve as PEI's "who's who" in gov't, business, & restaurants were there enjoying themselves. The Food - Yes, food. I only used one of my four free food samples (didn't feel like eating), but there was some good stuff to be had - some sort of pulled chicken in a red ale sauce on a ciabatta bun from The Gahan House, massive beer-battered onion rings from The Big Orange Lunchbox, calzones from Castello's, and a soup from the Island Stone Pub. 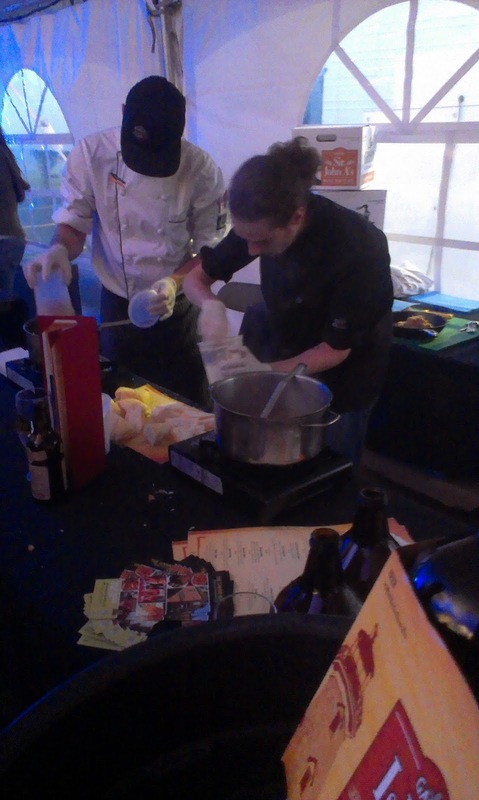 The free food samples (using beer) from local restaurants was a great touch. 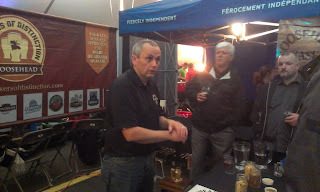 The Beer - There was some good beer to be had, for sure, and I was encouraged by seeing folks ask for things like Unibroue's beers (that are in our stores and I hope stay), and try things like a couple of different cask ales. Anything that broadens the minds of local beer drinkers is great. The beer of the festival, for me, was Bryan's 1772 IPA aged on a Spanish cedar spiral. It was flat compared to the normal IPA, but I like cedar's woody and spicy addition to the style. A bit strong for some, perhaps, but tasty. I was also surprised to find that Sleeman's Fine Porter was, indeed, pretty fine. May have been a bit metallic, but it was mostly a nice, roasty, chocolatey, medium-bodied porter. Revisting a few beers was nice, like St. Ambroise's Apricot Ale, which was there on tap. Still bright & summery. I also had McAsulan's Pale Ale on tap, which was better than when I had it in bottle from the last couple of times. Pump House's Red came off as chocolatey to me for some reason, which I thought odd. I also re-tried a couple of Picaroons. One was a butterbomb, but the other, the Yippee IPA (which was bad when I had it in bottle and on tap this summer) was actually pretty good - even picked something spicy & woody out of it I didn't remember from before. Casks! 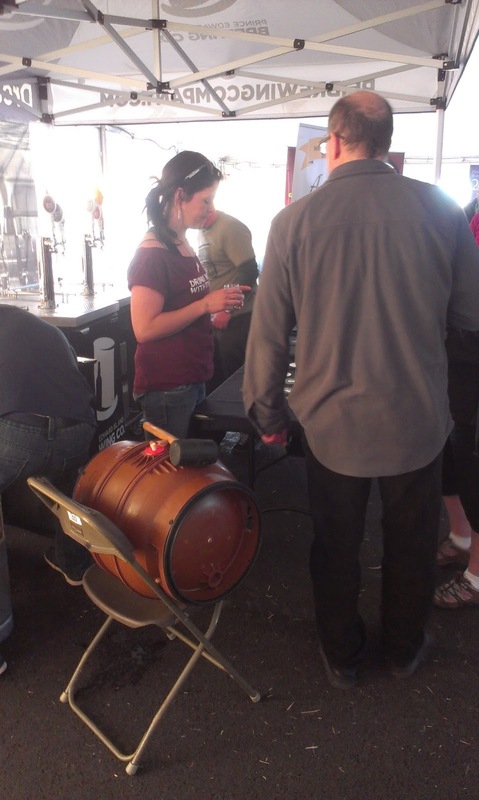 It was nice to see Moosehead bring their Cask Ale in. It was also served by the chap who brewed it. Also, the PEI Brewing Co. had a couple of specials on. One of them was a dry-hopped version of the Island Red which was pretty good - amazing for me, since their red is really the only one I don't normally like at all. Disappointments? Well, there were a couple for me. 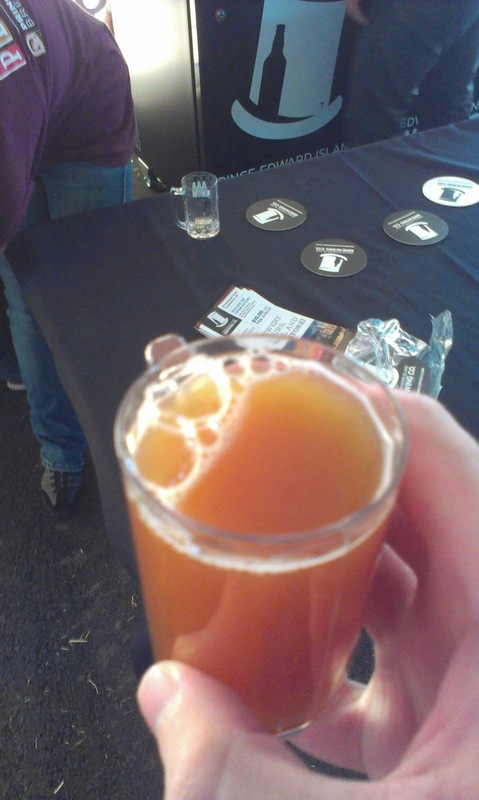 Amsterdam's Oranje Weisse didn't make it to the festival, and I didn't get to try the Blonde. I tried the Don Valley Bench from Mill Street, and thought it was a bit of a confused beer (tons of banana, some wood in the finish, and, I swear, something light like margarine... the Curious Parrot wasn't bad). I was also hoping to be a bit more wowed by Amsterdam's Boneshaker IPA. It was bitter, for sure, but was missing a strong hop aroma & flavour to balance that out. All-in-all, a good fest for my fellow Islanders and future Aleanders(?). Well-organized & planned... even had their own open & strong Wi-Fi signal. Hopefully, if you didn't make it last night, you might think of stopping by today between 2-5 or 6-9. Cheers, and looking forward to even more beer variety next year! Sounds like a great time at a well organized event. Any beer education opportunities? They were there if you went for them, I suppose. Brewers from a few breweries were there to talk to if you wished. On the site map was a section called "Taste Testing". I never saw it, and have no idea what it was. A few booths also had cups of different grains and hops to whiff or have a look at if you so wished.